The Emperor is one of my Birth Cards and I've just never felt very connected to it. When I think about The Emperor, ideas of "structure", "authority", "stability" and "patriarch" come to mind. Whether intentional or not, I've always been a bit unconventional, so these concepts have popped up as issues for me occasionally. So knowing The Emperor is my birth card has just sort of bummed me out. To me, it's kind of like being a "Wednesday's Child" which is another thing that hasn't exactly thrilled me. You know, that whole being "full of woe" thing. Well, I can finally say that I am now perfectly cool with my connection to The Emperor! Here's how it happened. Yesterday, I (somewhat reluctantly) went to a used bookstore to get rid of a few boxes of books in order to make my upcoming relocation a little less burdensome. I'm kind of a bibliophile, so it's not easy for me to let go of good books. But, my husband had helped me to realize that it was necessary at this point. As the buyer was going through the 100+ books I brought her, I started browsing the shelves of the store. I noted the worried glances my husband gave me and I assured him that I was "just looking." But, then I found "the Tarot Section." And, lo and behold, there was a copy of the Osho Zen Tarot, for only $10! This is a deck that has been on my Amazon wishlist for quite awhile. I was so excited that my husband just smiled and gave me the "okay, I can tell you need to get this" look. Plus, I had made a tidy little profit on the books I sold. So it was like getting the deck for free! I couldn't wait to cleanse, dedicate and check out the deck when I got home. 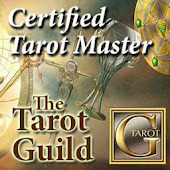 Other than a couple reviews I had read, I didn't really know anything about the deck other than it had a Zen point of view on the Tarot based on the teachings of Master Osho. The few scans of the cards I had seen online looked pretty cool. As I started going through the deck and examining the cards, I came upon The Emperor and felt totally confused. The Emperor was renamed in this deck as "The Rebel". What the heck??? It made no sense to me at all. Mr. Structure, Mr. Stability, The Daddy of the Tarot was a rebel? 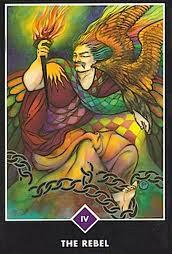 "The powerful and authoritative figure in this card is clearly the master of his own destiny... the torch he holds ...symbolizes the light of his own hard-won truth. Whether he is wealthy or poor, the rebel is really an emperor because he has broken the chains of society's repressive conditioning and opinions...His way of being is rebellious -- not because he is fighting against anybody or anything, but because he has discovered his own true nature and is determined to live in accordance with it... The Rebel challenges us to be courageous enough to take responsibility for who we are and live out our truth." Now that's more like it! For the first time, I'm actually pretty jazzed about one of my Birth Cards!